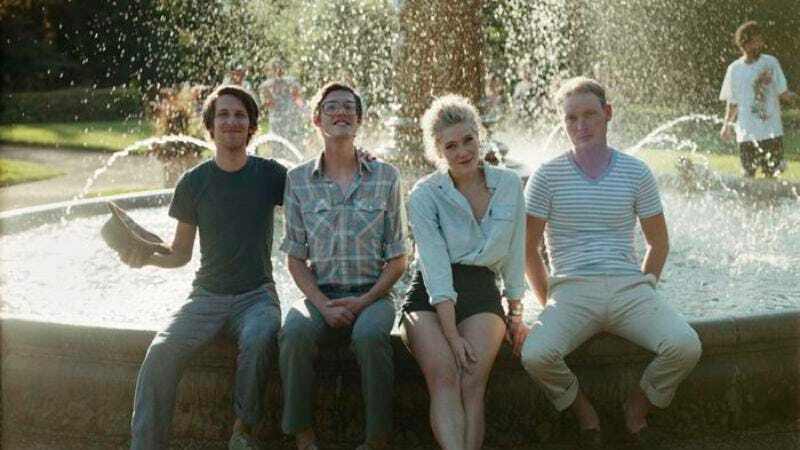 Caroline Smith And The Good Night Sleeps won over Minnesotans in 2008 with a winsome, instantly ingratiating folk-pop sound that came off like Feist fronting a highly competent coffeehouse band. They’ve grown into a far fiercer and more adventurous musical unit since then, as attested to by Little Wind, the group’s long-awaited forthcoming sophomore album. The product of two years of focused writing and recording time, it’s a densely layered and boundary-pushing record for the still-youthful quartet. Spritely acoustic strumming has largely been banished in favor of hypnotic electric riffage and straightforward verse-chorus-verse ditties expanded into sprawling soundscapes. Nowhere is this extreme makeover more apparent than on lead single and present 89.3 The Current staple “Tank Top,” a forcefully driving slice of moody indie-pop that finds Smith’s typically crystal-clear voice delightfully scuffed up with effects. Prior to the group’s CD-release gig at First Avenue Sept. 16, Smith talked with The A.V. Club about her teenage music-making adventures, the pros and cons of Kickstarter, and her love for Lil Wayne. The A.V. Club: Shortly after releasing Backyard Tent Set you were quoted by the Star Tribune as saying, “We think it’s important that our recording sounds like our live show.” There must have been a different mission statement guiding Little Wind, which has quite a few effects and layers on it. Caroline Smith: The sound is quite different on this record, but it was a pretty organic evolution. We weren’t trying to shock people and sound like a totally different band; that’s just sort of what happened. I still think it’s important to be able to have a live show replicate the record, so that’s an exciting challenge for us this time. We’re having a lot of fun learning how to play with effects pedals. [Laughs.] No matter what we did, it was going to sound a lot different than Backyard Tent Set; I wrote most of those songs when I was still in high school. AVC: You got an early start performing your music publicly compared to most of your indie peers, self-releasing a CD at age 16 and playing out in clubs and coffee shops on a regular basis. Do you ever go back and listen to that first album now? CS: Oh God, no! It’s the last thing I ever want to hear. It’s so embarrassing. If I were to play it, I would just be just shouting out every second, “I can’t believe I sang like that, played guitar like that, wrote like that!” [Laughs.] I do have to give props to my mom for getting me out there performing at a young age. I hated it at the time, but I think it definitely has given me a leg up in some ways, although it’s also made me into a bit of a ham. [Laughs.] I honestly think where it’s helped the most is the talking between songs. I’m still not completely comfortable up there, and [I] say embarrassing things, but I definitely have seen other young artists get up there and just look terrified because it’s one of the first times they’ve performed publicly. I feel thankful to have already gotten that stress out of my system. CS: Kickstarter is a great idea, but at the same time it is a bit awkward for the artists involved. We bounced back and forth over whether to do it. You have to feign a certain level of confidence to ask your community for $6,000. We weren’t expecting such great support so quickly. It ended up being a great way to really bond with the people that care about our music. Now of course it’s about that time where pledge rewards are actually due, so I’m talking to you right now staring at my mom’s car that’s loaded down with shipping materials and packing tape, and thinking about how long it will take to mail everything. It’s a good problem to have though. AVC: Releasing “Tank Top” as the first single feels like a bold choice. Your first album was very well received. Why select the song that sounds least like any of your previous material as your reintroduction to your fans? CS: It wasn’t an easy decision, because we were concerned how our existing fans were going to respond. Ultimately we wanted to introduce people to this record right, which meant showing them our most balls-to-the-wall, in-your-face song. We’re not a band interested in writing Backyard Tent Set over and over. I figure it’s better to assert ourselves early on as a group that will always be changing and growing. In the tour van we listen to all kinds of music—I love Lil’ Wayne, TLC, Bon Iver, Frank Sinatra—and every time we fall in love with something new we want to try and make those kinds of sounds ourselves, for better or worse. I think the biggest mistake a band can make is to feel too pigeonholed to explore whatever interests them at the time.